Firing clay transforms it from its humble, soft beginnings into a new, durable substance: ceramic. Ceramics are tough and strong and similar in some ways to stone. Pieces of pottery have survived for thousands of years, all because clay met fire. The temperature needed to transform soft clay into hard ceramic is extremely high and is usually provided by a kiln. You cannot fire pottery in a home oven because ovens do not get up to the high temperatures of more than 1,500 F that you need for firing clay. 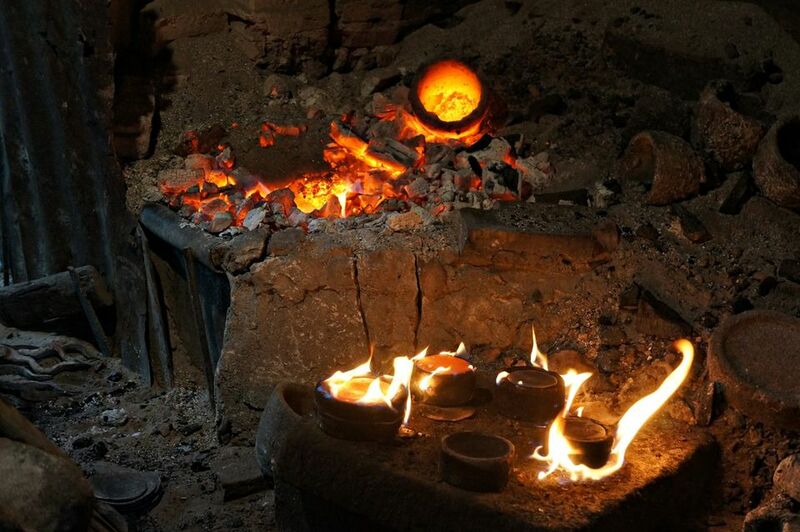 Firing is the process of bringing clay and glazes up to a high temperature. The final aim is to heat the object to the point that the clay and glazes are “mature”—that is, that they have reached their optimal level of melting. To the human eye, pots and other clay objects do not look melted; the melting that occurs is on the molecular level. This process is usually accomplished in two steps: bisque firing and glaze firing. Bisque firing refers to the first time newly shaped clay pots, or greenware, go through high-temperature heating. It is done to vitrify, which means, "to turn it glasslike," to a point that the pottery can have a glaze adhere to the surface. Greenware is fragile. To start, it must be bone-dry. Then, it must be loaded into the kiln with a great deal of care. The kiln is closed and heating slowly begins. A slow temperature rise is critical. During the beginning of the bisque firing, the last of the atmospheric water is driven out of the clay. If it is heated too quickly, the water turns into steam while inside the clay body, which can cause the clay to burst. When a kiln reaches about 660 F, the chemically bonded water will begin to be driven off. By the time the clay reaches 930 F, the clay becomes completely dehydrated. At this point, the clay is changed forever; it is now a ceramic material. The bisque firing continues until the kiln reaches about 1730 F. At this temperature, the pot has sintered, which means it has been transformed to the point that it is less fragile while remaining porous enough to accept the application of glazes. After the desired temperature has been reached, the kiln is turned off. The cooling is slow to avoid breaking the pots due to stress from the temperature change. After the kiln is completely cool, it is opened and the newly created ​"bisqueware" is removed. Ceramic glaze is an impervious layer or coating applied to bisqueware to color, decorate, or waterproof an item. In order for earthenware, like fired clay pottery, to hold liquid, it needs a glaze. Potters apply a layer of glaze to the bisqueware, leave it to dry, then load it in the kiln for its final step, glaze firing. The glazed item is carefully loaded into the kiln for the glaze firing. It must not touch other pots, or the glazes will melt together, fusing the pots permanently. The kiln is heated slowly to the proper temperature to bring the clay and glazes to maturity, then it is slowly cooled again. The kiln is opened and unloaded after it has cooled completely. This second kiln firing causes a remarkable change in the clay and glaze. It completes the transformation of pots from a soft, fragile substance to one that is rock-hard and impervious to water and time.